Review: Get Over It Productions bring The Tempest to @EtceteraTheatre You don’t get this at the RSC! Get Over It Productions’ all-female, gothic-inspired, Tempest at The Etceterais a glorious, comic, irreverent but ultimately faithful version of Shakespeare’s last play. If not already familiar to you, the plot of The Tempest is a straightforward one. Twelve years previously, Prospero duke of Milan, after neglecting his duties as duke – being “rapt in secret studies” of sorcery – has been supplanted by his brother Antonio, with the aid of the King of Naples. Cast adrift in “a rotten carcass of a boat,” he came to a magical island with his infant daughter Miranda. 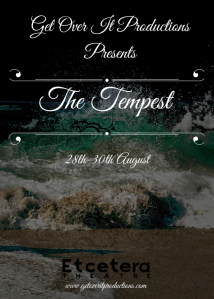 The Tempest @ The Cockpit: ONE Night Only!